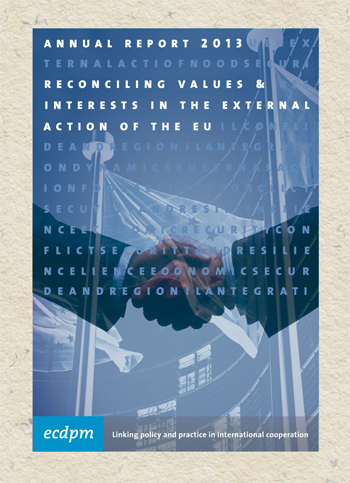 1) We analysed initial experiences and views on the EU’s Statebuilding Contracts, a new form of EU budget support provided to fragile and transition countries. The outcomes formed a valuable step towards further discussing this new instrument within EU institutions. 2) We conducted a lessons learnt exercise on mediation capacities within the EU, reviewed the EU's institutional set-up to support mediation and produced several fact sheets on mediation. This work was highly appreciated by the EEAS, the European Parliament and the Irish Presidency of the Council of the EU. 3) Our analysis on New Deal Implementation led to a request by the g7+ secretariat to provide them with specific technical support. We assisted the g7+ in strengthening fragility assessments and monitoring frameworks. 4) At a high-level meeting on the future of Africa-EU relations, organised by the European Think-Tanks Group, we facilitated a session on peace and security challenges within the context of the partnership. 5) Together with our ECDPM sister programme on strengthening EU external action, we explored the EU’s regional approach towards the crisis in the Sahel and its implications for EU-Africa relations. One outcome of this work was our well-received publication on ‘The Mali Crisis and Africa-Europe Relations’. 6) Together with the German Agency for International Cooperation (GIZ), we helped to formulate a method for assessing the impact of the African Peace and Security Architecture (APSA) and the quality of its interventions. 7) With our publication ‘Resilience, a Trojan horse for a new way of thinking’, we unpacked the concept of resilience and demonstrated how it could be used to foster more integrated and comprehensive thinking about institutional development in fragile states.